One of the comments I most frequently hear when I do presentations or lead a garden tour is, ‘‘I want a perennial that blooms all season.’’ Personally, this has never been a real selling feature of a plant as I find excitement and joy in how gardens evolve throughout the seasons. I believe in a well planned garden: as the blooms of one garden resident fade, those of a neighbour should take centre stage. For a regular update of the flowering plants in the Toronto Botanical Garden (TBG), be sure to follow our What’s in Bloom blog, by Head Gardener, Sandra Pella . Also, plan to visit the garden every few weeks, to see for yourself what has recently come into flower. I digress, so back to the original request for a plant that blooms all season. Agastache ‘Blue Boa’ is definitely a great contender. Here it is photographed in the President’s Choice Show Garden growing alongside Echinacea ‘Leilani’. Both of these perennials are now in their second year of evaluation for garden performance. They, along with many other interesting new perennials being trialed at the TBG, have been developed by world famous plant breeder Dan Heims and his amazing team of hybridizers at Terra Nova nursery in Oregon, USA. Each year the TBG is fortunate enough to receive a number of new perennials to test in our Toronto garden. I will admit, opening the shipment of the new arrivals is certainly one of the spring season’s highlights for me. For the past two years, Agastache ‘Blue Boa’ has started to bloom in mid-June producing spikes of showy violet-blue blooms that are irresistible to bees, butterflies and even the occasional hummingbird. Last year, all of the plants continued to bloom well into October with little to no deadheading. When in full bloom, the plants stand just less than 3 feet (90 cm) tall. 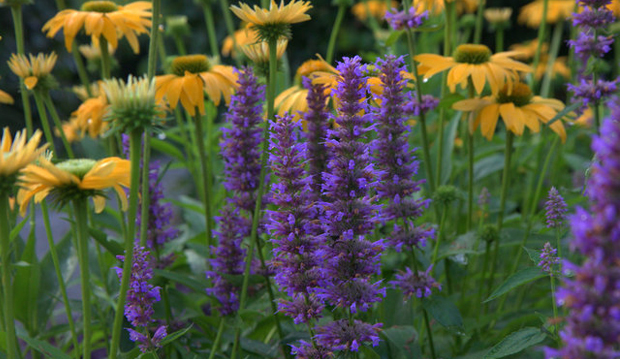 For the best garden performance, I recommend growing Agastache, commonly called hyssop, in full sun. With that said, our plants do not seem to be bothered by the light shade caused by a nearby hedge. Do your homework: there are many Agastache, both annual and perennial varieties available. Most Agastache also have aromatic foliage. Two additional perennial Agastache currently in bloom at the TBG include A. ‘Blue Fortune’ at the east end of the Entry Garden and lavender hyssop, A. foeniculum in the woodland walk and bird habitat. Lavender hyssop is a showy native obtained from our friends at Wildflower Farm. This reliable, long bloomer produces a number of seedlings every spring so one should be prepared to edit it every season. Last September, while leading a tour of the TBG gardens, A. ‘Blue Boa’ caught the eye of two of my personal gardening mentors, Marion Jarvie and Keith Wiley. While both of these highly respected public speakers and incredible plants people are both from England, we are very fortunate that Marion Jarvie resides in Ontario. In fact, Marion has been a member and instructor at the TBG for some 30 years. Check our latest program guide for upcoming courses she will be teaching. In addition to being an instructor at the TBG, Marion also offers seasonal classes in her incredible home garden. A must see, it has been featured in numerous garden magazines, and is open to the public on a few select days a year. Upcoming dates are listed on her personal web page, www.marionjarvie.ca. Prepare to be delighted!